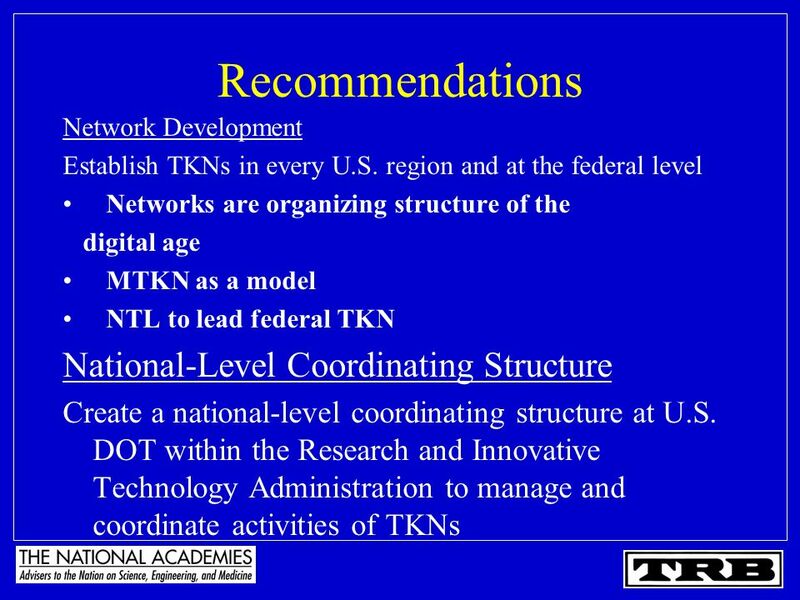 3 Transportation Knowledge Networks: A Management Strategy for the 21st Century Provide strategic advice to the federal government and states on how transportation information should be provided and managed, including – Core services, – Sustainable administrative structure, and – Funding options to meet the needs of the public and private transportation sectors. 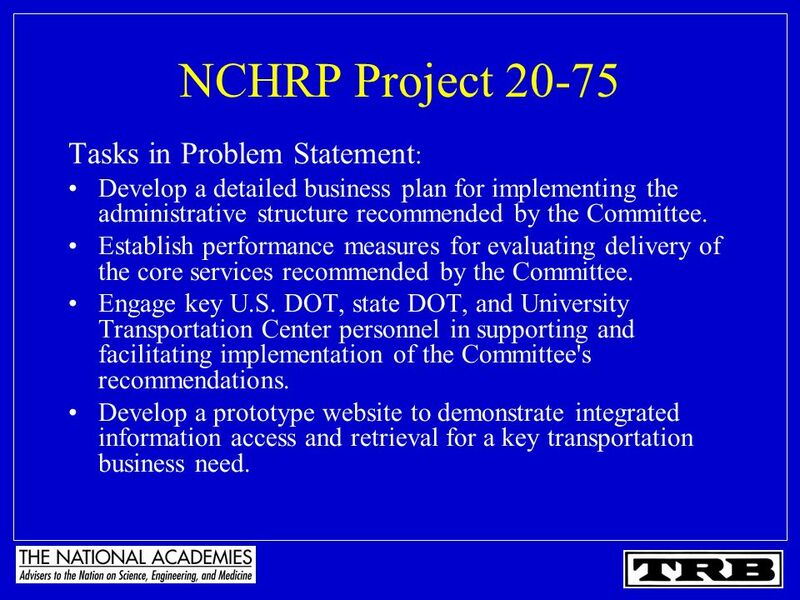 13 NCHRP Project 20-75 Tasks in Problem Statement : Develop a detailed business plan for implementing the administrative structure recommended by the Committee. Establish performance measures for evaluating delivery of the core services recommended by the Committee. Engage key U.S. 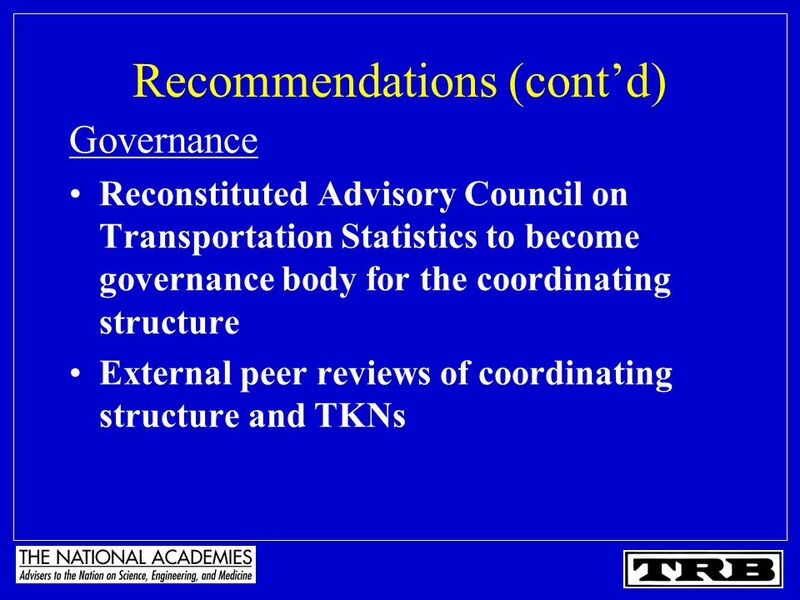 DOT, state DOT, and University Transportation Center personnel in supporting and facilitating implementation of the Committee's recommendations. Develop a prototype website to demonstrate integrated information access and retrieval for a key transportation business need. 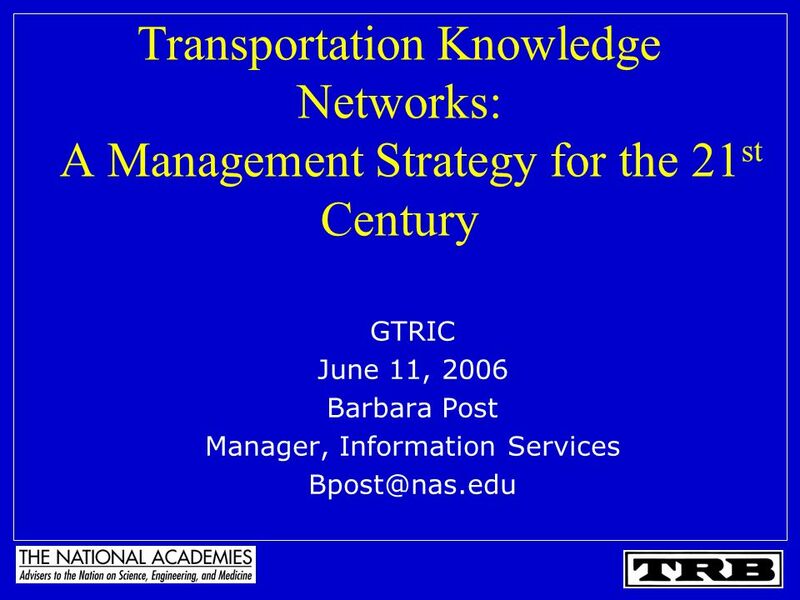 Download ppt "Transportation Knowledge Networks: A Management Strategy for the 21 st Century GTRIC June 11, 2006 Barbara Post Manager, Information Services"
Transportation Libraries – A Guide to the Players GTRIC – Government Transportation Research Information Committee SLA Annual Conference, Seattle Convention. 1 ROAD WEATHER RESOURCE IDENTIFICATION(RWRI)TOOL Version 1.0 Ray Murphy, ITS Specialist FHWA National Resource Center NTOC - Talking Operations Seminar. Danville Area Transportation Study. Fundamentals of Metropolitan Planning Organizations Adam Aull Danville Area Transportation Study MPO ASCE Presentation. 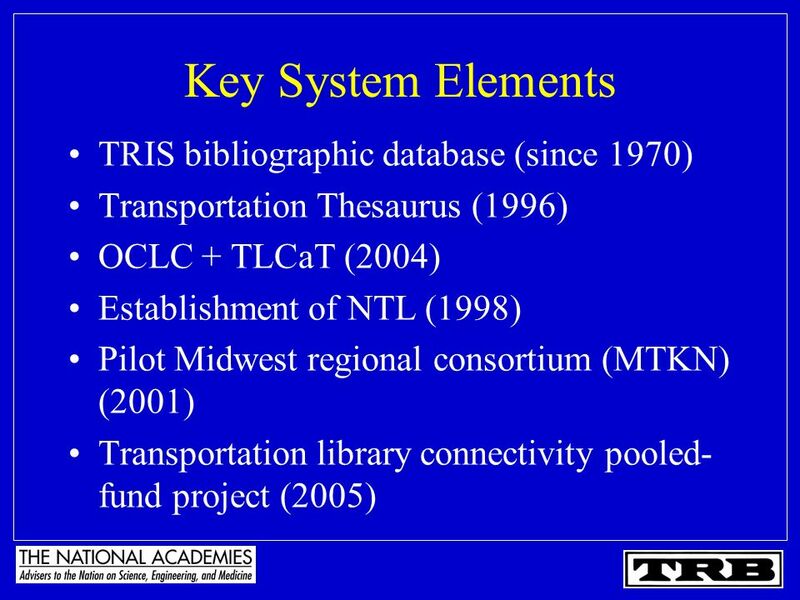 Transportation Information and Knowledge Networks - The Leadership Challenge - Nina Mclawhorn, Research Administrator Wisconsin Department of Transportation. MTKN: Sharing our Experiences SLA GTRIC Meeting June 5, 2005 Arlene Mathison University of Minnesota Center for Transportation Studies. 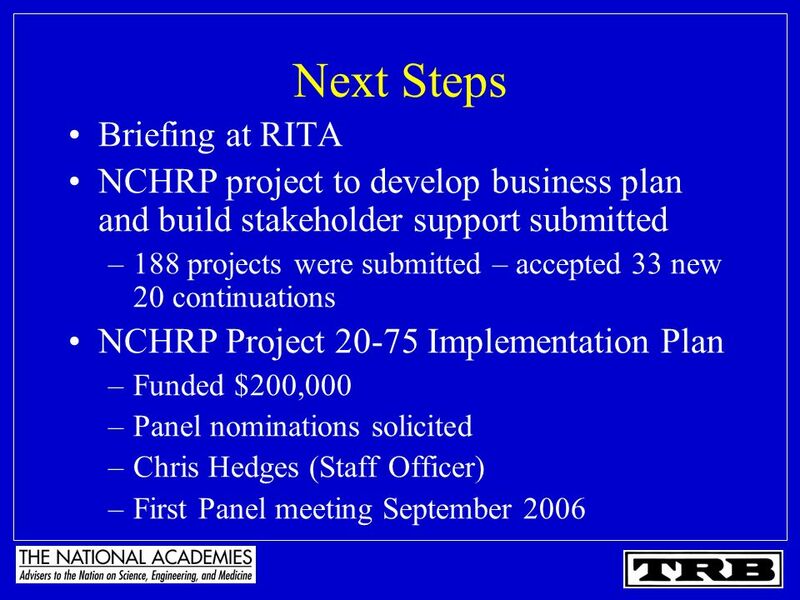 MTKN Update – Summer th Annual Meeting: Sep , 2008 in Springfield, Illinois. Two new members - Connie Field/Portland Cement Association. 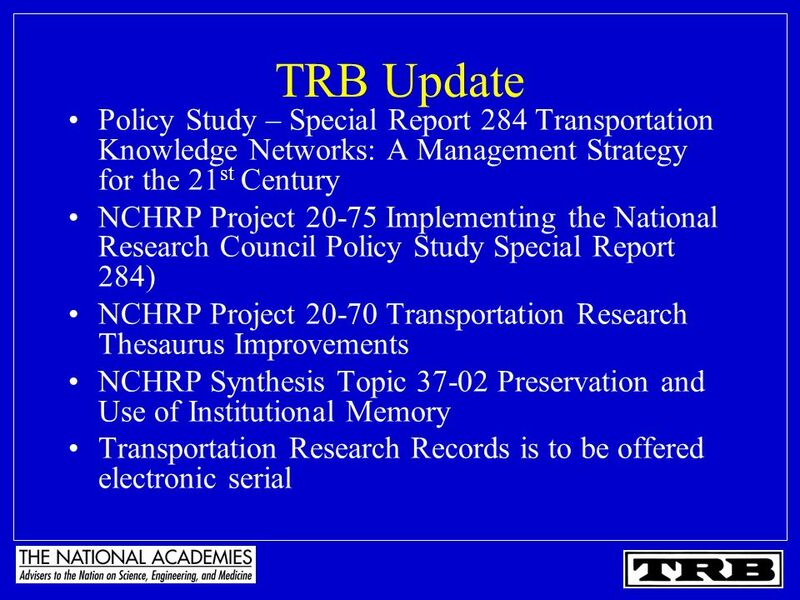 TRB TRANSPORTATION RESEARCH BOARD. ACADEMY COMPLEX NATIONAL ACADEMY OF SCIENCES NATIONAL ACADEMY OF ENGINEERING INSTITUTE OF MEDICINE NATIONAL RESEARCH. National Transportation Library GTRIC Nelda Bravo SLA, Toronto June 5, 2005. MTKN and Pooled Fund Consortia Serving Better Together Janet Bix, ODOT Library Steve Cochran, WSDOT Library GTRIC Meeting June 11, 2006. 2011 Mid-Year Report ADC-60 Business Meeting. 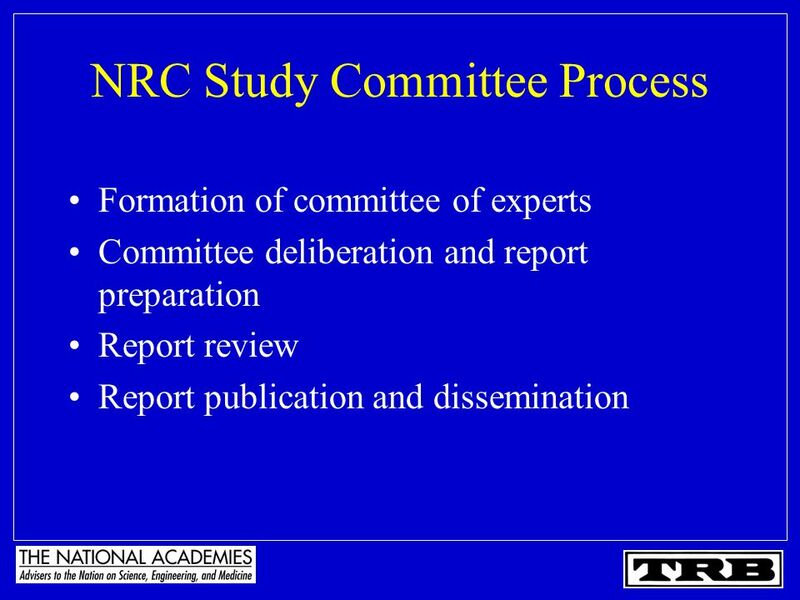 TRB Technical Activities Council 2011 Strategic Initiative: Research TAC and Committee on Research to give. 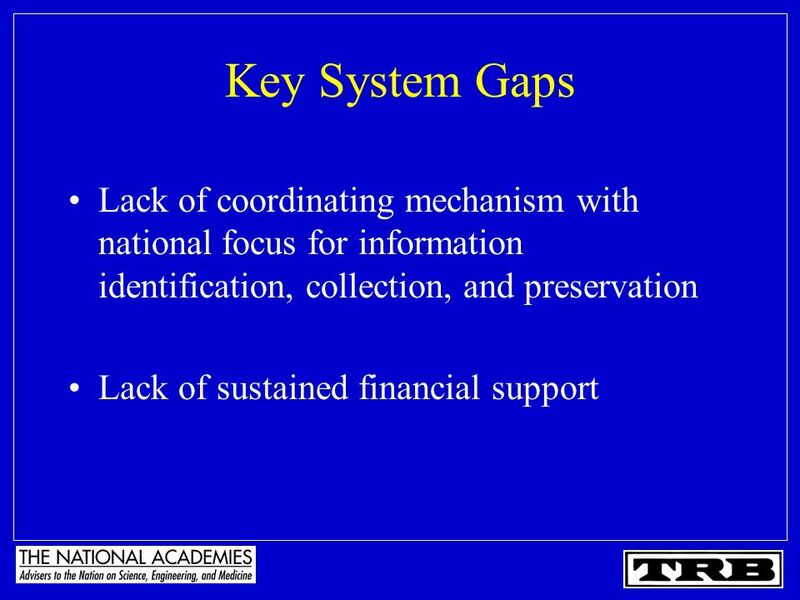 METU Library: A Pilot Institution in the Performance-based Budgeting Project Hale Yumşak & Emre Hasan Akbayrak 24 th IATUL Conference, 2-5 June, 2003. 1 Looking at the TPBs Draft Participation Plan Presentation to the Transportation Planning Board July 18, 2007 Sarah Crawford Transportation Planner Department. Goals of Workshop District Education Technology Plan Goals 8 goals aligned to State/National Education Technology Plans Strategies to meet challenges. 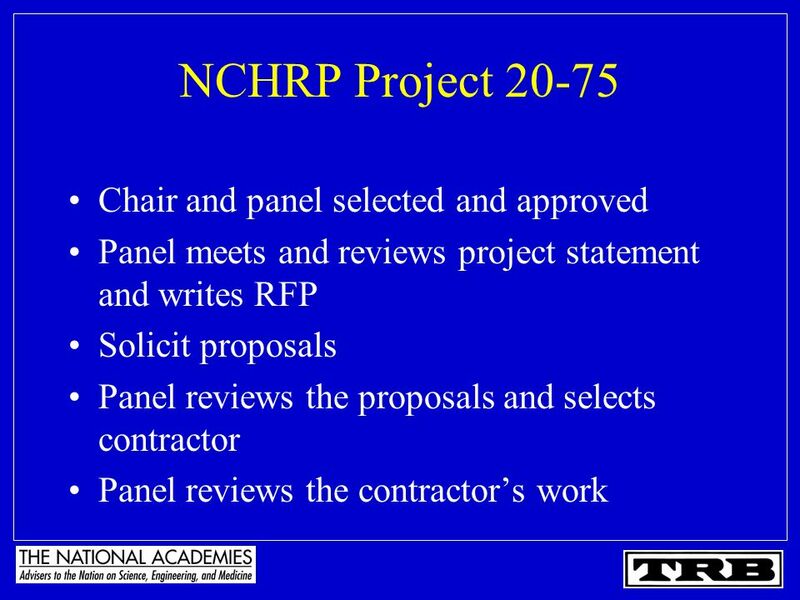 NCHRP 20-93: Development of a Guide for Transportation Technology Transfer Presented By: Mark M. Hood P.E. 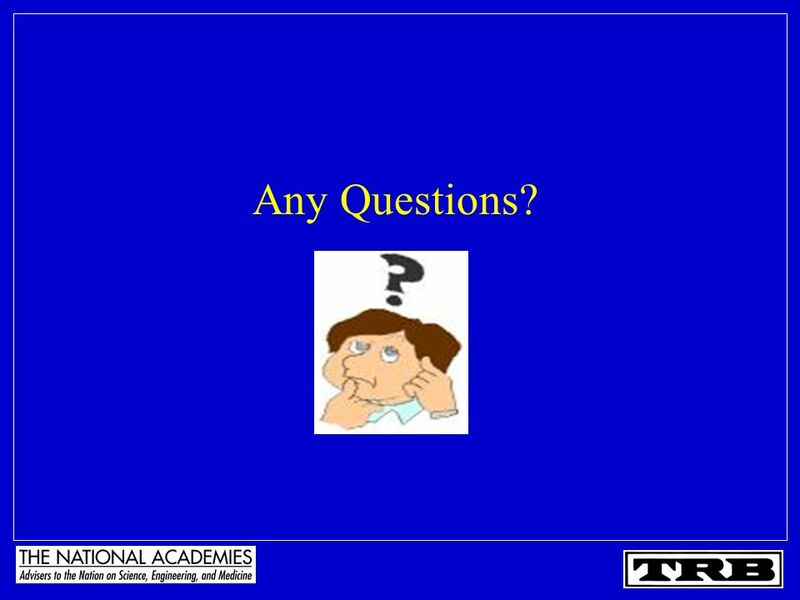 Pennoni Associates Inc. Summer AASHTO Research. JISC Collections 04 September 2014 | Presentation to PRATT-SILS MA Summer School | Slide 1 JISC Collections. 1 RESOURCE CENTRE NETWORK (RCN)DEVELOPMENT PROJECT AN INITIATIVE TO PROMOTE INFORMATION AND KNOWLEDGE MANAGEMENT WITHIN THE WASH SECTOR. World Bank Financial Management Sector September 2010. 12 August 2010 Summer Conference Season Wrap-up. Agenda  SLA Annual Conference  LIST Midyear Meeting  NTKN Annual Meeting  AASHTO TKN TF at National.